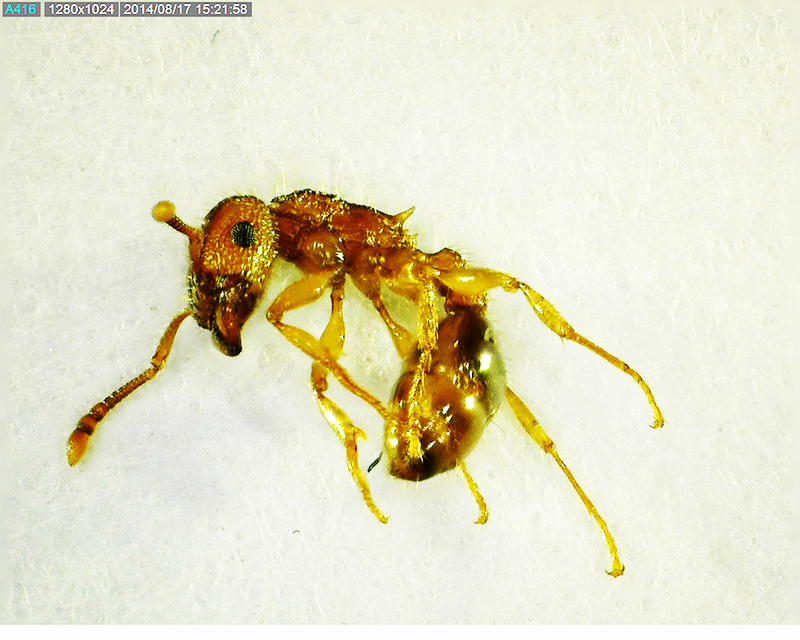 Summary: In this article the author reports on specimens of small (2.7-3.4 mm in length) stinging ants collected from two locations in Williamson County, Texas, members of the Formicidae subfamily Myrmicinae and identified as the penny ant, Tetramorium bicarinatum (Nylander, 1846). This tramp ant, which is native to the Indo-Pacific, has managed to stow away on sea-going vessels and, most likely, aircraft as well, and is now spread worldwide, though — from all indications — it is nowhere very numerous. It has two isolated segments (petiole and postpetiole) between the alitrunk and gaster, conspicuous moderately-large eyes, a 12-segmented antenna, simple spurs on the middle and hind tibia, conspicuous propodeal spines, a square shaped petiole, a light colored head and alitrunk, and a dark colored gaster. This species is relatively rare in Texas, but is known to be capable of disrupting species diversity wherever it is found. In the two cases where the author encountered colonies of this ant, the residents of homes it was invading were complaining of nodular skin lesions that — based on advice received from physicians who had diagnosed the lesions as being of insect origin — they had presumed to be caused by bed bugs. As J. K. Wetterer explains in a recent paper published in Sociobiology, this ant has often been confused with another ant, Pheidole guineensis (Fabricus), leading some to apply “Guinea ant” as its common name. Coincidentally, Wetterer goes on to explain, an unrelated species from Africa with the valid taxonomical name Tetramorium guineense (Bernard, 1953), compounds the problem and adds to the confusion. To help improve the public’s understanding of this ant’s identity, Wetterer proposes a new common name, the penny ant, based on the coloration of the ant’s copper-brown exoskeleton, which — as the microscope photos posted here show clearly — is similar to that of a newly minted copper penny. 001. 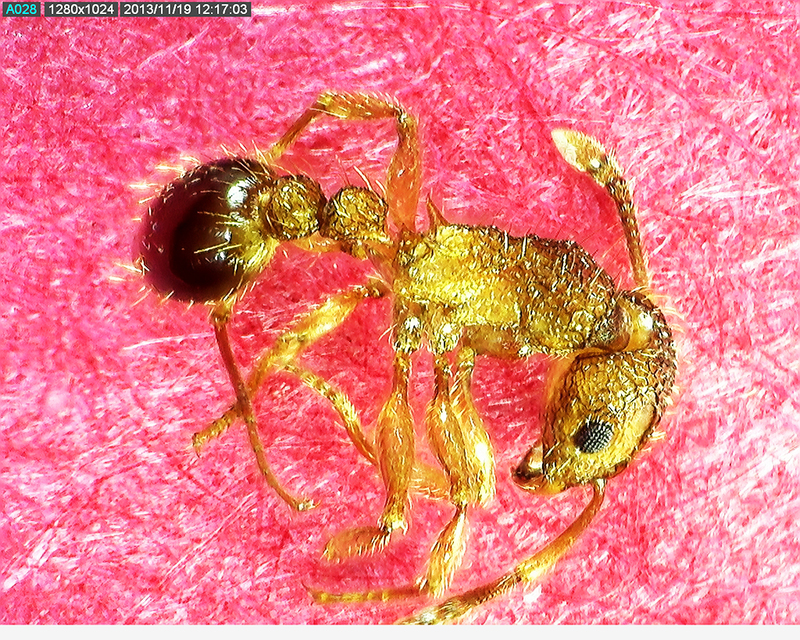 Ant found under refrigerator, near a dermestid beetle larval casting, on 13 August 2014. 002. Ant collected from the mailbox, at the end of the driveway of the same home, on 16 August 2014. On Tuesday, 12 August 2014, I received a call from a young mother whose 7-month-old baby boy had been experiencing a recurring series of tiny red skin lesions all over his body. Since birth this baby has had bouts of rashes, suspected by his pediatrician to be a consequence of normal postnatal development that he should soon outgrow. Recently, though, the lesions have been more robust in appearance, and sometimes presented as hardened nodules with light-colored pustules at their centers. On seeing these, his pediatrician wondered if they might be caused by insect bites, possibly even bed bugs. Hence the mother’s telephone call to my office. “Would it be possible,” she asked, “for you to conduct an inspection to determine what might be the cause?” She explained that her schedule was open the next day. I arrived at her tidy, tree-shaded home — located in a rustic northwest Austin subdivision, on the southern edge of Williamson County — at 10:00 AM the next morning. A forensic sweep was soon conducted in the master bedroom, and the room where the child’s crib was kept. It took only a few minutes to discount the likelihood that bed bugs were involved. No evidence of bed bug infestations was found in the baby’s crib, the baby’s or parents’ bedrooms, or in any of the bedrooms’ furnishings. As usual, when nothing is found in the bedrooms of a home where bed bug infestations are believed by the occupants to be present, I next conducted a forensic sweep of the flooring under the kitchen stove and refrigerator. Between 30-40% of the bed bug inspections I perform conclude with finding organisms other than bed bugs that are causing skin lesions in the human occupants of the home. Often the organisms involved are found in parts of the home other than the bedrooms. To most, this is surprising, as the lesions they are experiencing seem most prominent in the morning, after a night’s sleep, leading them to believe the events causing the lesions took place while they slept. Sometimes that is the case, but the lesions that show up after a night’s sleep may also be the outward manifestation of an event or series of events that took place one, two, or as many as three or more days earlier. The kitchen often hosts as many organisms as any other place in the home, particularly on the flooring under the refrigerator and stove. Such locations provide harborage for insects and other animals, and tend to be stocked with what might best be termed “accidental nutriment.” The latter is deposited over time when pet food and remnants of the cooking arts fall into cracks and crevices and are swept under appliances. After fermenting and hardening, this food matter becomes fodder for the minuscule wildlife that thrives in darkened places, out of sight and mind of the humans who live there. As the insect and arachnid occupants of this cryptic redoubt proceed through their life cycles, they leave behind artifacts that open windows through which forensic investigators may view, and reconstruct, the past. 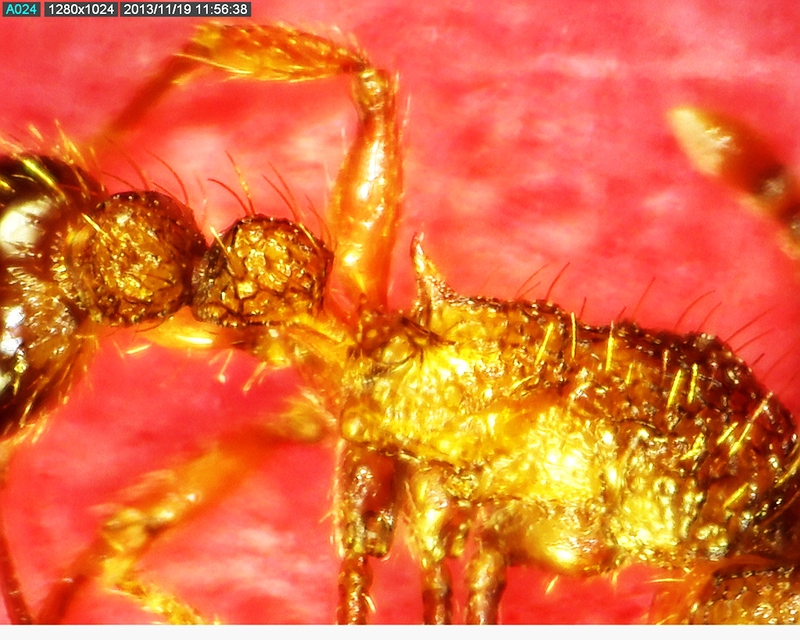 Soon the casting of a dermestid beetle larva, and — next to it — the carcass of a small ant, were spotted. Both were placed on a neutral gray plate, staged under a digital microscope (an AM4815ZTL Dino-Lite Edge), and thereupon displayed on the screen of a lap-top computer, visible to all to see. 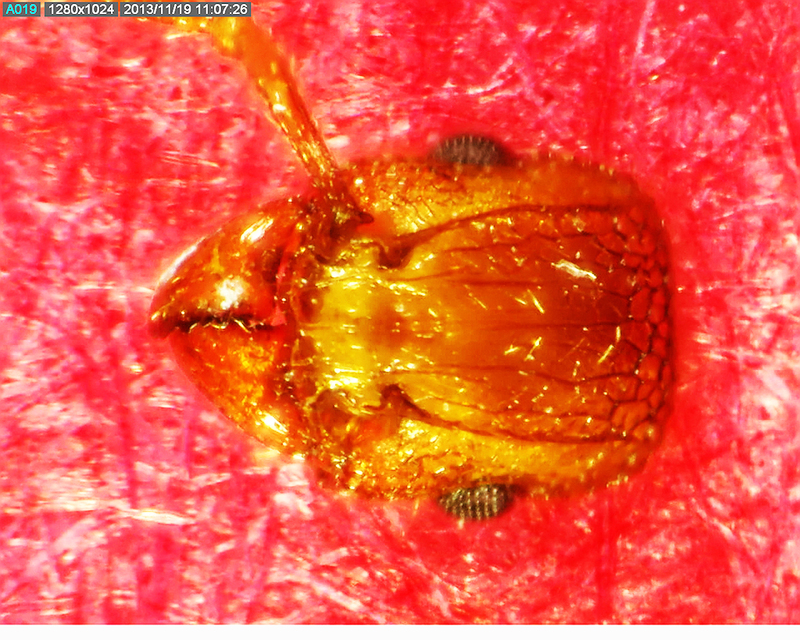 The dermestid beetle larval casting was found to be of a species that — in its larval life form — bristles with hastisetae, tufts of fine hairs with spear-pointed tips and barbed shafts. Dermestid larval hastisetae are capable of producing skin lesions in sensitive individuals. Their lesions present in the form of rashes and reddened wheals of various sizes, but not as hardened nodules of the kind that had been found on the infant in this home. Next the microscope stage was manipulated to bring the ant into view. As the magnified image of the ant’s habitus came into focus, I was surprised at the striking resemblance it had to another ant I’d found almost nine months earlier. That ant, from another subdivision about five miles north of here, in south-central Williamson County, was discovered on 18 November 2013. It was not a Texas native. Workers from at least two mounds, situated in the soil of that home’s yard, were foraging inside the home and stinging the occupants. The stings produced skin lesions that the home’s occupants had thought, as in the case before us, to be bed bug bites. As in this instance, no bed bugs were found, and — unlike the case before us (where dermestid beetle larval hastisetae was found) — the only other candidate that might have caused the bites experienced by the homeowners was this ant. I’d treated the earlier home and yard with a bait and a growth regulator, and have heard nothing more from the owners. In the meantime, my analysis of the specimens I collected of that ant continued, and plans were being made to publish an article on it before long. Now, with evidence that its range was extending, the importance of publishing those findings increased. The home where this ant had been found last November was ensconced in a relatively new subdivision in south-central Williamson County. My tentative conclusion at the time was that it was a species of fire/harvester ant in the Myrmicinae subfamily (Hymenoptera: Formicidae), and the tribe Myrmicini. Before encountering it in the present case, I had not been successful in identifying it to genus and species. Now, with evidence the ant was more widespread than I’d earlier believed, I redoubled my efforts to arrive at a firm conclusion, first using Bolton’s dichotomous keys to the Formicidae, then using Carleton College’s on-line Identification Guide to the ants of Cowling Arboretum and McKnight Prairie, administered by Tim Linksvayer, which identified the genus as Tetramorium. Armed with this crucial information, a perusal of the literature on the genus produced detailed descriptions of various species, ultimately leading to T. bicarinatum (Nylander, 1846). 201. Dorsal head of ant species depicted in fig. 200. Note the deeply incised frontal carina. 202. Mid-body region of the ant depicted in fig. 200. Note the propodeal spines, and the pointed propodeal lobe. Subfamily Myrmicinae: approximately 140 genera in 25 tribes, all cosmopolitan; the pupae lack cocoons; some species retain a functional sting; the petioles have two nodes; nests are permanent, in soil, rotting wood, under stones or in trees; the subfamily includes leaf cutters (tribe Attini), acrobat (tribe Crematogasterini), harvester (tribe Myrmicini), big-headed (tribe Pheidolini), and fire (tribes Blepharidattini, Myrmicini, and Solenopsidini) ants; KEY TO TRIBE: the ants described and depicted in this article appear to be myrmicines with 1. 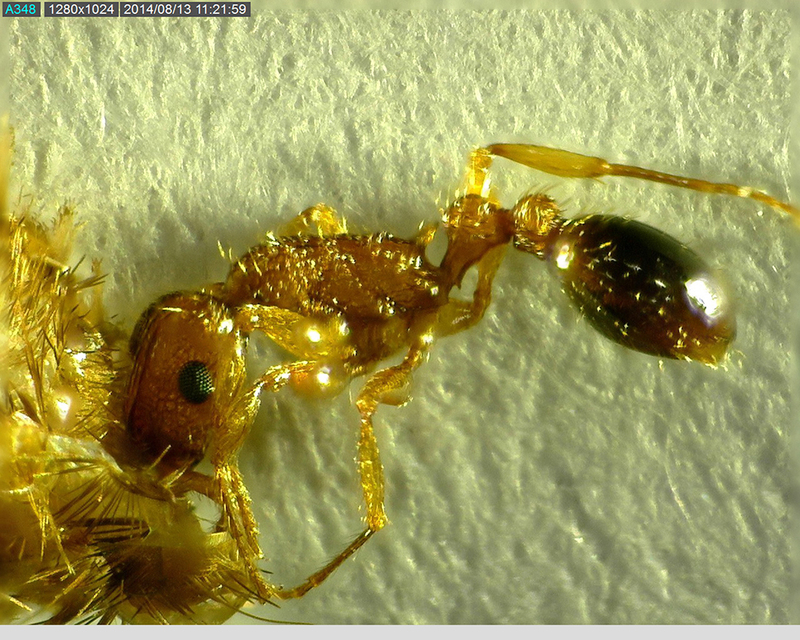 12 antennal segments… microscopic analysis continues, and images of the characters that eventually led to the diagnosis of this ant as a member of the tribe Tetramoriini, the genus Tetramorium, and the species T. bicarinatum, are now being prepared for posting here. Please stand by. Wetterer, J. K. Worldwide spread of the penny ant, Tetramorium bicarinatum (Hymenoptera: Formicidae). Sociobiology 2009 Vol. 54, No. 3, pp. 811-830.